I’ve been popping into this spot regularly over the past 14 years. It’s changed. But in a good way. There was a time when it was a grotty, miserable locale which closed around 21:00 on most nights – except Sunday, when it wasn’t open at all. But you don’t need to know that. All you need know is that it is now a light, clean, modern, airy and comfortable bar-restaurant which serves a full range of snacks, tapas and meals at reasonable prices. There was a period, after a super-hostel opened nearby, when Ji, the owner, strayed a little into the dark side and started pandering to guiris (uncultured visitors) with sangria and dubious paellas. He’s since realised that meeting the more demanding needs of locals is the way to sustain and grow an intelligent business. Service here is pretty damn good – you will not have to wait long to get your repast assembled. 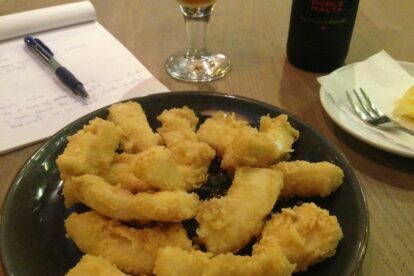 Chocos andaluza – fried slices of lightly battered cuttlefish – is one of my favourite tapas dishes. You’d be surprised, or possibly not, by how many places manage to screw up this simple dish. Here, they’re fresh and light, with the necessary edge of crispy crunchiness. Highly recommended. If needing something more substantial than a sandwich, a plato combinado, or a few plates of tapas, for lunch, then you could opt for a reasonably good menú del día. My only complaint about this spot are the prices for bottles of wine and cava – ridiculously expensive when compared with classier places.